Why Does Pregnancy Make Me So Hungry? Are you struggling with consuming enough food to finally make you feel full? Are you wondering why this pregnancy has you wanting to eat every second of the day? Constant hunger is actually a normal part of pregnancy, especially during the second trimester when you get your appetite back. Learning why you may be so hungry and how you can help to tame that appetite can be beneficial for both you and your baby. Increased Appetite During Early Pregnancy? Constant Hunger — A Sign of Pregnancy? What is a Hunger Pang? What Causes Hunger Pangs When Pregnant? When Does Your Appetite Increase? Why Do You Feel Hungry 24/7? Early pregnancy is difficult because not only are you suffering from morning sickness and tons of other bodily changes, but you may have an increased appetite. The reason women experience this increased appetite during the first trimester is because they are typically vomiting from morning sickness and leaving their stomachs empty. Your appetite likely seems to be increased because the food you are eating is not being absorbed into your body. Your body is trying to grow a tiny human and still keep you nourished. It is likely you are consuming fewer calories now than you did before you even became pregnant. You need to try to navigate the bumpy waters of cravings and aversions to ensure you eat certain healthy foods and keep them down. You and your baby need all of those calories (source). Very early on in your pregnancy, you may begin to experience particular food cravings and hunger pangs. Hunger pangs alone aren’t enough to immediately lead you to believe you are pregnant, but if they are paired with a missed period, tender breasts, morning sickness, and fatigue — you might be onto something (source). Hunger pangs are felt in the upper abdomen. They typically cause you to have an intense feeling you are hungry. The inner lining of your stomach will become irritable, which leads you to feel like you are hungry (source). When you are pregnant, your stomach becomes empty after digestion. An empty stomach leaves the inner linings exposed and can cause them to rub together. The irritation of the walls of the stomach rubbing together can cause the hunger pangs to occur. The best thing you can do to avoid hunger pangs is to make sure your belly is never completely empty. Don’t indulge in large meals 24/7, but feel free to eat small snacks when need be. There are numerous things that can be the cause of your hunger pangs. It can be difficult to pinpoint just one, but below you will find several possibilities. Your baby’s growth: The second and third trimesters of your pregnancy are a time of great growth for your baby. Your baby will need you to consume many calories to help with that growth, and if you aren’t eating enough, you may experience hunger pangs. Consuming too many liquids: You should always stay hydrated when pregnant and be sure to drink tons of water. There is a threshold you don’t want to reach though — consuming too many liquids can cause your stomach lining to stretch and result in intense hunger pangs. Shoot for 10 cups of fluid every day (source). Spicy food: Spicy foods can cause heartburn and indigestion, but they can also irritate your stomach lining. Poor chewing: If you aren’t chewing your food enough it could lead to indigestion and cause stomach pains. If you spend a little extra time chewing your food, it can also help you feel full longer! You may not have complete and total control over hunger pangs, but there are some steps you can take to help them subside. Eat regularly: It’s important to keep that stomach full, so consuming small amounts of food frequently throughout the day can help keep your hunger at bay. Carry snacks: You always want to make sure you have some healthy options at your disposal. Stay hydrated: Hydration is an important part of pregnancy and you should try to consume significant amounts of water throughout the day. Remember not to totally overdo it or you can stretch that stomach lining. Many women may notice the increase in hunger during the first trimester, but the second trimester is when hunger seems to peak. Once your morning sickness subsides, you will be thrilled to be able to keep down any food, so you may want to splurge from time to time. Some women notice their hunger seems to subside once they reach the third trimester. You may feel like you are never hungry, or you may be hungry every couple of hours. Your baby is growing bigger and this leaves less room for your stomach. So, your stomach isn’t able to hold as much food as usual and this can cause your appetite to decrease. Even if you don’t feel hungry, you need to eat enough to help sustain you and your baby. You should be eating at least 500 extra calories a day (source). The simplest answer to this question is your growing baby. Your body has to work in overdrive when you are pregnant to help sustain you and your growing baby. This means your body is constantly working both night and day (source). You need those extra calories because you are busy growing a human! Think about the extra energy it takes to grow a heart, brain, and lungs. It’s amazing! All of this energy is coming from you and what you consume. It is likely your body is burning calories faster than you can even consume them. This quick transition causes you to feel like you need to eat all the time (source). Listen to your body and don’t feel guilty if you feel like you are always digging for food. Remind yourself your third small salad of the day could be helping your baby develop eyes or other important organs. Let’s face it, the pregnancy hunger can become overwhelming and it is important we find a way to help keep it subdued. You shouldn’t completely ignore your hunger, but you should try to find healthy ways to manage it. We mention hydration more than once and that’s because it’s extremely important. Sometimes our bodies can trick us into confusing hunger with dehydration. You may think you immediately need food, but a cup of water could do the trick. You should try to drink about 10 cups of water a day. Some women think once they become pregnant, they can eat anything and everything they want. You need to remember your food consumption is very important, but it does have its limits. In the first trimester, you can keep your calorie intake the same. You should consume about 300 more calories per day during the second trimester, and about 500 more during the third. If you are pregnant with multiples you should double the extra intake. The above calorie intake is an estimate for typical pregnancies. Be sure to consult with your doctor for an accurate caloric intake that best suits you and your baby. It is easy to eat anything when you are pregnant because you can shrug the extra weight gain off as being baby weight, but you shouldn’t overindulge. Keep your diet healthy and nutritious and opt for foods that can benefit you and your baby rather than add to the extra pounds. Fresh foods are always the better option over processed ones. No one wants to deal with a hungry pregnant woman with no accessible food. Make sure your fridge or purse is always stocked with healthy options that can help ease your hunger. It’s always great to have more healthy options at your disposal than junk because it will force you to consume the better foods at some point. Every once in a while you need to reward yourself and indulge in your favorite food. Give yourself several bites of your favorite food one day, or consume that yummy ice cream once a week. We all have cheat days and these don’t have to stop when you are pregnant, as long as your other meals focus on nutritious items. Eating small meals throughout the day can help keep your intense hunger at bay. You can take small items to work with you so you have healthy snacks on hand. Having healthy options at your disposal makes it easier for you to consume them over fast foods or junk food. 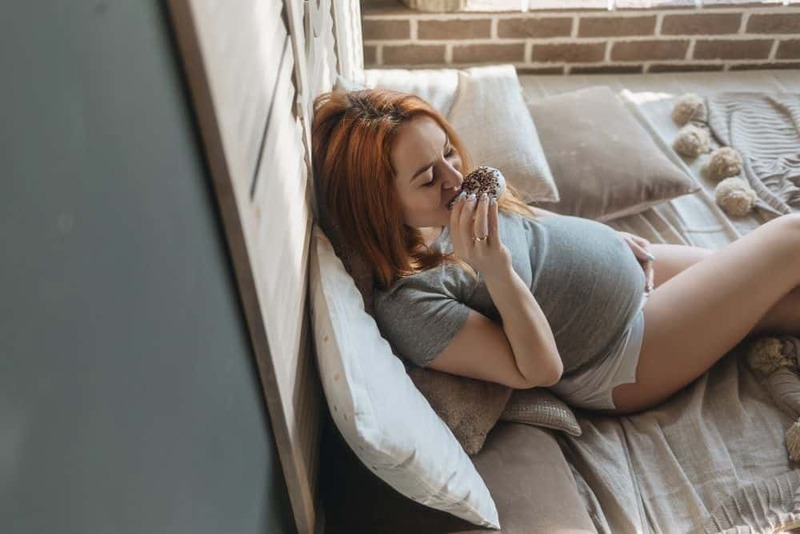 Obviously, you are expected to put on some weight when you are pregnant, but with the constant hunger how are you supposed to keep the weight gain under control (source)? Begin pregnancy at a healthy weight. Eat often, but in moderation. Stay hydrated, especially with water consumption. Accept cravings, but make them constructive. Talk to your doctor about how much weight you should gain. Your starting weight determines how much weight your doctor will recommend that you gain. You don’t have to consume three-course meals multiple times a day to keep yourself full. It may seem like an impossible task, but it is possible to eat simple meals and actually make yourself feel full (source). Eat slower: Your brain needs at least 20 minutes to process that your body is actually full. Simply taking some extra time to chew your food can help you achieve that fullness faster. Eat half your portions: Split your meals up into several a day. You don’t have to stick to the traditional three meals a day — eat when you are hungry. Don’t indulge in large meals at this time, rather eat six small meals a day. Busy your mind: If you are sitting around, it is inevitable you can be easily distracted by the hunger you are feeling. If you pick up a hobby, you can help distract your mind from the hunger and redirect your attention elsewhere. Hunger is an inevitable part of pregnancy. We would be crazy to think a woman is expected to consume the same amount of food as she used to even though she is now actively growing a human. Your body and your baby need the extra calories to be healthy and well-nourished. You shouldn’t feel guilty about consuming more food because you are now burning way more calories. You need that extra food to continue to keep you moving and your baby growing. Let us know in the comments section what some of your favorite pregnancy snacks are!